This gym bag can divide into two. It enables you to leave your gym gear in the car, locker or office, whilst taking your valuables with you. The zip of the main compartment is designed to allow easy access to your sportswear. 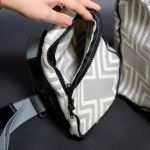 The small compartment is for essential valuables that you would rather keep with you at all times, so you can detach this and use as a bag when it is not convenient to carry a bulky bag. 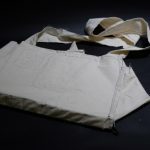 Anthony designed this bag for a persona he developed when thinking of a better life for himself. 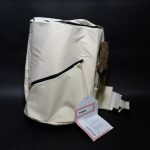 The bag is designed for an active young man who works very hard, goes to the gym, but still enjoys a night out. Anti-theft element: The bag divides allowing the user to keep valuables safe whilst leaving their sportswear in the car, locker or office. This bag was designed for a social worker who visits clients regularly. 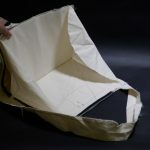 The bag enables them to find things easily; the well-organised compartments mean they can check documents and case work easily while on the move. 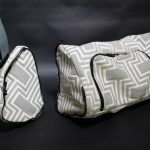 The bag also allows them to work with privacy and without having to take their laptop out of the bag. Anti-theft element: The laptop stays in the bag and so is attached to the body while in use, making it less attractive to thieves. This backpack is designed for cyclists. It expands and retracts depending on the amount of things that need to be carried. It can attach to the bike when it is too heavy, too. Brian designed this bag for cyclists who often visit new locations for work. Brian was released from prison before he finished this ambitious project, but told us he would recover his late mother’s sewing machine in order to continue making. Anti-theft element: The bag can become smaller when you are not on the bike, allowing you to keep your valuables with you at all times. This backpack has a selection of straps across the front which gives it its unique design. 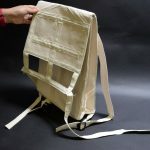 It is perfect for carrying a laptop, books and documents. Dennis designed this bag for a busy student who loves trendy as well as original items. Anti-theft element: The straps on the front make it difficult to understand how to access the bag for those unfamiliar with its design. Two of the straps are longer and can be tied at the front for extra security. 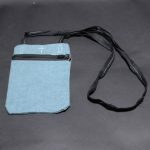 This bag is a small pocket with strap designed for a man to hold essentials such as keys, wallet, cards, money, phone and tobacco. 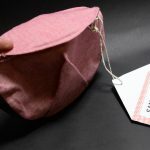 Aimed at young self-employed professionals, this bag is safer than a trouser pocket and, when using public transport, the bag is easy to conceal under a jacket. Anti-theft element: The strap crosses from the back to the front panel, obscuring access to the main zip by strangers. Access to the pocket is via a hidden zip to provide extra security. This bag is designed for new mothers to carry the essentials for their baby. Usually, this bag would be held on the buggy, but in busy areas, when the baby is held in the mother’s arms, it can be worn on the back. George designed this bag for his wife and baby daughter. While he was in prison, they were using public transport much more often as he was not there to drive them around. 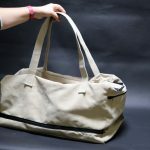 He designed this bag to make their everyday life easier. 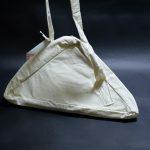 Anti-theft element: The adaptability of the bag means that it can be carried in different ways to avoid having to put it on the buggy or on a nearby chair when the baby needs attention, meaning the bag is not stolen (or forgotten). This bag has been designed for a club manager who works at night and usually walks to work. The bag can hold a phone, keys, tobacco, oyster card and wallet, and occasionally a tablet. The flashy fabric is for use during the day, as he likes to be original, but at night the black flap makes the bag more camouflaged. 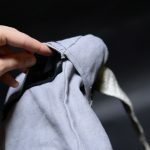 Anti-theft element: The black flap is used to camouflage the otherwise colourful bag when walking down dark streets at night, whilst also protecting the zip. This bag has the zip in an unusual place. The user simply turns the bag upside down in order to unzip it and access their valuables, which is difficult for a pickpocket to do. Anti-theft element: The zip is accessed from the bottom of the bag and opens in the opposite way to normal, making dipping harder. 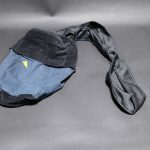 This pouch was inspired by John’s son Darren who works on a building site but is absent-minded and sometimes careless with his possessions, which he often leaves lying around insecurely. The design allows the user to slide their phone in and out of it from the top, whilst the side pocket of the pouch offers easy access to credit cards and cash, so everything is in one place. 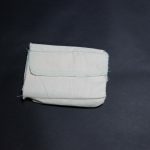 Anti-theft element: The pouch can be attached to a belt so can be carried near the body at all times on building sites. It also has a fake flap to deceive any pickpocketers. 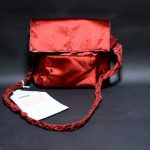 This elegant bag was designed for a woman to carry her valuables safely while at a party. 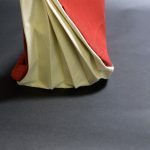 The size and pleats offer a unique aesthetic and represent elegance and originality. 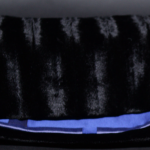 Anti-theft element: The flap prevents dipping whilst the pleats make it slightly more resistant to slashing. The straps provide extra safety. 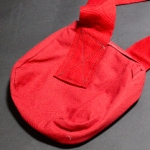 This bag is designed to be worn under, or inside, a jacket. It is very small and and light and is designed to carry essentials such as money and keys. K developed this bag thinking of his own experience in the community, and the way he would like to keep his essentials safe. Anti-theft element: When the user is unsure of his/her environment, the bag is small enough to wear under a garment as light as a T-shirt. 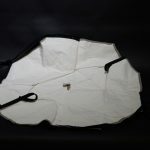 The light strap allows it to fold and be put into another bag or jacket pocket, as and when the user needs. This bag is designed for travelling abroad. It expands to double its size in order to accommodate extra products purchased overseas. It can also become smaller when the user arrives at their destination. Mo designed this bag when thinking of the times he travelled to India with his family. As they usually take taxis, he finds classic bags more practical than a backpack. They always buy a lot of gifts and products and often need extra space when returning to the UK. Anti-theft element: This bag has a secret folder at the base. This folder seems to just be a panel to keep the shape but has a zip where you can hide your most important valuables when you are travelling; cards, cash, insurance documents and passport etc. This backpack has a fake zip around the main compartment so the only way to get into it is through the back panel. Although this limits access for the user, it makes it harder for the abuser. Mr. T has thought of using other shapes to make the real zip more easily accessible for the user, and would like to develop this next. Mr. T developed this product for Monica, a girl who loves hiking and often goes travelling. 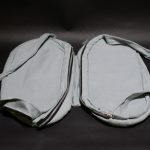 Anti-theft element: The rucksack has a very common aesthetic and the fake zip is placed where one would expect the real zip to be. When opened, a pink neon fabric prevents access to valuables. This guitar shaped backpack is designed for cyclists. 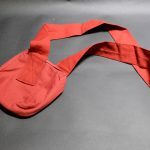 It can be worn either on your back by clipping the straps across your front, or the other way around. When worn on your front, the shape allows you to cycle comfortably whilst having easy access to the bag. 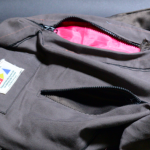 Anti-theft element: There is a zip that is accessed from the inside of the bag for valuables. In addition, the main zip has a concave shape, the opposite to what you would expect, making opening it slightly harder for a thief. 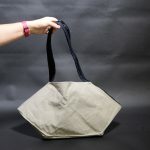 This bag is designed to transform itself by unfolding to become the perfect mat for festivals, picnics and outdoor events. 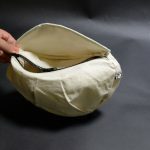 When folded, it has two compartments to hold food and beverages and is made from waterproof material to keep the items dry. Rokas considered using conductive material to facilitate solar technology to charge phones in places with limited resources, and would like to explore this further. Rokas designed this bag for Sophie who he likes to go to music festivals with. 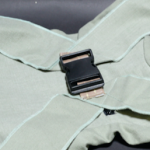 Anti-theft element: The zips which seal the pockets become the handles to avoid dipping. This bag is designed for those selling the Big Issue. It is made from water resistant material and has a pocket where you can store magazines while you are selling them. It also has a secret pocket where you can hide anything that you don’t want others to notice. Sam was inspired by his days on the street and how his group of friends had the habit of teasing anyone who has a new bag. He points out that “when you live on the streets your bag is your home” so this design is aimed at being both useful and meaningful to homeless Londoners. 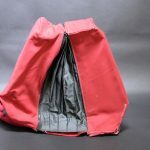 Anti-theft element: The main compartment is accessed via a zipper, which is covered by a flap and secured with velcro, adding two layers of protection for items. 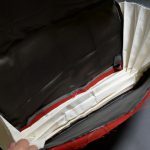 The secret pockets are located either side of the main compartment along the main length of the bag and are also sealed with velcro, keeping valuables hidden from sight. This is a small women’s bag. It has an original rounded shape to carry essential valuables such as keys, phone, wallet and some make-up. 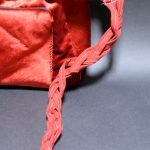 In designing this bag, Sam was inspired by his daughter and was further able to determine the shape, colour and form of the bag by interviewing a female officer and asking for her feedback on the design. 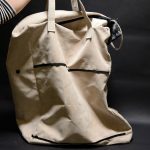 Anti-theft element: Its flap and zips prevent theft by dipping, and its round shape makes slashing the bag unnoticed hard to get away with. This bag has been designed for a gym instructor. It is simple and the perfect size to carry essential items for everyday use. 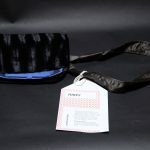 Anti-theft element: The flap of the bag has velcro all around it which makes opening the bag really noisy, alerting the user that someone is trying to access the bag. This is a big bag for art students who need to carry their laptop, books, and craft materials (especially for knitting) in one bag. 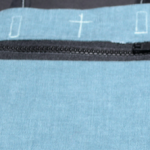 The laptop pouch is intelligently designed to hang in the middle, so that the wool and soft materials protect it. Takka found knitting very helpful in prison as it is mindful and rehabilitative. He is also capable of knitting whilst walking the streets of London. 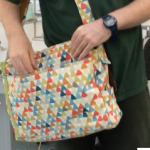 He designed this bag to allow students to walk while knitting too – on the way to college, for example. The bag has a special compartment for needles or brushes of different sizes. Anti-theft element: The most valuable element, the laptop, is protected and camouflaged among craft materials. 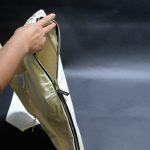 In addition, the flap covers and protects the main zip and the pockets are placed at an angle, making them harder for thieves to access. 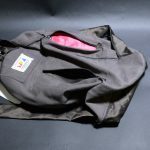 This bag is designed for a manager of a night club to use on public transport, when travelling at night to and from work. 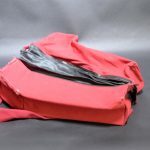 The bag can hold either a laptop or tablet, as well as files, keys and other everyday items. It has an adjustable strap and a zip at the top of the bag. 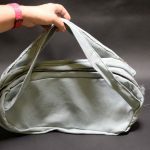 Anti-theft element: The bag is designed with an inside pocket and three outer pockets, two of which have velcro seals for security. 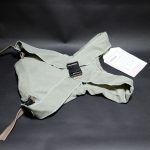 There is also a flap that conceals the top zip of the bag and which is secured by two clips.